Concept cars look beautiful and futuristic, but why do manufacturers spend millions developing them if they’re never going to make it into production? Take, for example, the DS X e-tense, a “2035 dream car” produced by the French luxury brand DS. Half open-topped sports car, half luxury saloon, its outlandish styling looks as though it has come straight from the pages of a superhero magazine. Inside, it’s no less radical – there’s even a holographic personal assistant. It is designed to show what the company thinks a hugely powerful, all-electric self-driving machine might actually be like. It bears little relation to anything the brand currently produces, but that is hardly the point. Some of its radical styling is expected to make it on to a new road-going car that will be unveiled later this year. Other ideas will feed into future designs, and provide a road map for technical research. “A concept car is a development accelerator,” explains DS design director Thierry Metroz. Its role, he says, is to “test the new technologies that we imagine for the future, and accelerate their development”. Some concepts are a clear statement of intent. Three years ago, Porsche stole the headlines at the Geneva Motor Show with the Mission E – a concept for a fast, high-powered, long-range electric car. The reaction, from press and public, was very positive. As a result, the German marque will begin production of a real-world electric sportscar, the Taycan, in 2019. Prototypes like this take ideas that are already relatively well developed, and put them into a public arena to test reactions. Others have a life beyond the shows. The 1955 Lincoln-Mercury Futura, for example, starred in a Hollywood movie, and eventually became a Batmobile in the 1960s Batman TV series. Making sense of change is a common theme among concept car designers at the moment. For generations car companies have been focused on making petrol or diesel models that appeal to individual drivers. But the current move towards electrification, the headlong development of self-driving technology and the likely expansion of shared use vehicles, potentially threatens the very existence of traditional manufacturers. If we really are heading for a world where city dwellers – at least one day – rely on electric-powered robot taxis to get around, car brands will have to adapt or face extinction as their traditional business models collapse. Media captionWill we want to use cars inside our homes in future? Renault has chosen to address this uncertainty by embracing it. The French manufacturer has produced a whole fleet of concepts, offering different perspectives on this electrified, automated future. They include a car which actually becomes part of your living room, a large robot-taxi designed to transport a large group of people at once, and an automated delivery van. At the Paris Motor Show recently, it launched the EZ-Ultimo, a sleek driverless luxury limousine with wooden floors, and styling modelled on the radical Prada store building in Tokyo. It certainly looks striking. “This is part of our vision for urban mobility, for smart cities,” says the company’s chief designer, Laurens van den Acker. “We think that this future is going to be increasingly autonomous, more connected and shared. That means you won’t own a car any more. But you will be able to access a service. Part of the challenge seems to be to show that the car of the future can still be desirable. Peugeot, for example, has spent a year working on the e-Legend, a retro-styled coupe which harks back to a classic design of the 1960s and 1970s. 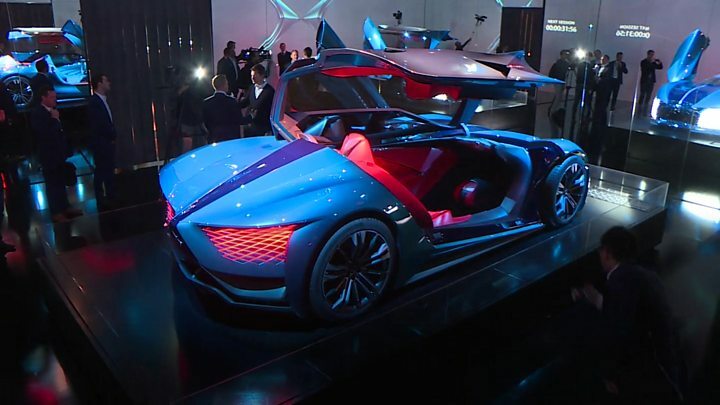 A throwback on the outside, but thoroughly futuristic on the inside, it is a vision of how an electric sports car – with self-driving as an option – could still get pulses racing. “Just because we will be integrating a lot of technology with electric and autonomous cars, that doesn’t mean the overall experience has to be cold and unemotional,” says head of design Matthias Hossan. No-one can say for sure where exactly the car industry is heading. But by allowing designers to let their imaginations run free, carmakers can at least start to prepare themselves for an uncertain future – and gain some good publicity into the bargain.